To continue from yesterday, my gut feeling is that if I'm truly, reflectively performing a women's spirituality methodology, then I should already be integrating much of what is of value in these transformative methodological frameworks. I think, however, it would be respectful to note when I am specifically "calling out" some related aspect of these frameworks in my work, e.g. : if I am using women's spirituality to study a particular culture's shamanism I should also note that I am applying an indigenous studies methodology. Further, I should take a moment to review that particular methodology's primary or best-known voices to be sure I am clearly and correctly doing so. 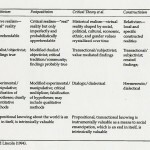 Reviewing the various methodologies and philosophical frameworks as laid out in Guba & Lincoln's table (click on thumbnail for legible version; reproduced from my previous Methodologies class), I find myself aligning ontologically along a more participatory framework, especially since I do feel I have direct influence upon my reality. My epistemology is not so clear-cut; I have difficulty distinguishing between the described ideologies of critical thinking, constructivism, and participatory. I presume, for example, that the constructivists and critical theorists both believe they too are critiquing subjectivity by their questioning of the possibility of objective experimental results. I am not entirely sure participatory can make such an exclusive claim on experiential, propositional, and practical knowing, either. As a single example, the entire basis of critical theory's Gramsciian dominant paradigm is the fact that "everyone knows" that's how things are. What is more experiential and practical than that? 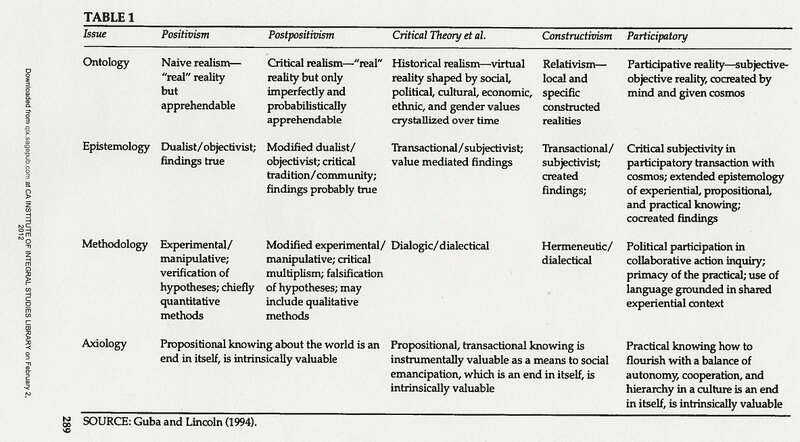 I also find myself becoming suspicious of the framework which the table itself may be unwitting proposing. For example, generally when one column or issue in a comparative table is more fully described than all the others, that tells me it was likely written by someone of that particular ideology. Further, I have trouble believing a positivist would really describe themselves as having a "naive" realism; that seems a bit belittling, even though I disagree with positivism. Moving along, I definitely favor a participatory methodology. I am uncomfortable, for example, with the use of deception in quantitative experimentation, and I worry about what that teaches us regarding the acceptability of lies and deception in daily life. If it's for the best of reasons (no, really — this time for sure!) then is lying a positive social value? I do not think so, since that leads to the mentality which created some of the early positivist experiments where, for example, in one experiment in the 1950s, men with syphilis were divided up into two groups based on race. The white men were cured and told they were cured but needed to return for several later check-ups. The black men, however, were told they were cured but would also need to return for several later check-ups — when in reality they were only given placebos, so the (white male) doctors could study the progression of the disease on unwitting human subjects! This is, quite frankly, outrageous behavior on the part of individuals who should have known better; it should never have been done to anyone. Which leads quite naturally to axiology — and again, I find myself thoughtfully puzzling between the axiology of participatory, and of critical theory & constructivism. I agree that knowing how to flourish in a culture is valuable, but I'm not sure we should so easily accept hierarchy as a value. Further, this sounds somewhat like a monocultural emphasis, and I am quite sure I do not agree with that. I believe the best way to shed the dangers of arrogant ethnocentrism are to make sure we are transactionally knowledgeable about many cultures… and I feel strongly that social emancipation is a truly worthy goal as well. On the other hand, I do not care for propositional dualisms — I believe we struggle still, today, with the harms they create. After review, I believe I shall stand by my previous statement: if I am performing good research via the methodology of women's spirituality, and occasionally sharpening my gaze slightly via the respectfully-applied lens of one or more of the transformative methodologies, I will produce good science while also remaining true to my personal beliefs.